Russian phenom Timofey "Trueteller" Kuznetsov is widely regarded as one of the world's best cash game players. He excels at NLHE, PLO, and Mixed Games and has won many millions of dollars both live and online. Here we take a look back at his five biggest winning pots played online. All five of Kuznetsov's biggest ever pots took place over a two month period between 22nd June and 23rd August 2013 at Full Tilt Poker, and they all took place in what became known as the "MalACEsia" games. The "MalACEsia" games were a series of 6max sessions at the $400/$800 Deep Ante NLHE tables which took place primarily over the summer of 2013 and were centred around the continued presence of Paul "MalACEsia" Phua, the mega-rich Malaysian businessman and (at the time at least) amateur poker fanatic. In this pot the action folds around to Trueteller who raises to $2k from the cut-off with Kh Ks, Viktor "Isildur1" Blom then three-bets from the small blind with 8s 9s and the action folds back to Trueteller who four-bets to $20k. 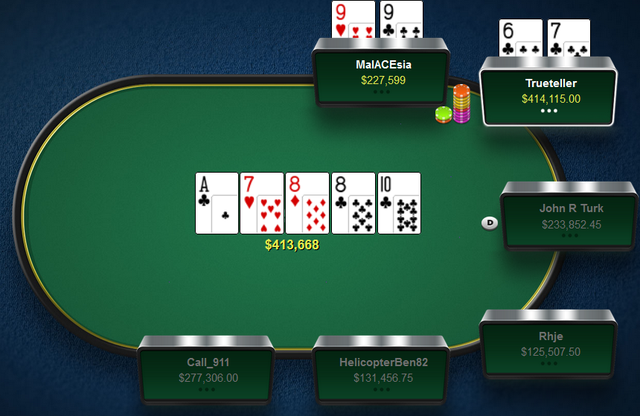 Isildur1 calls and they see a 9 high rainbow flop. 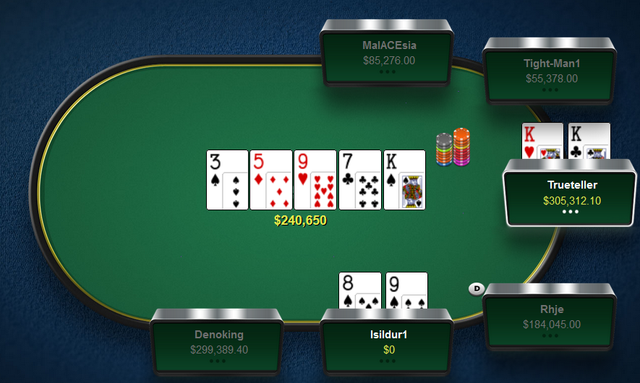 Isildur1 check-raises all-in after Trueteller bets $14.4k and Kuznetsov makes the call and finds himself well ahead. Another King on the river simply ices the cake for Trueteller who scoops his fifth biggest ever online pot. The first action in this hand is a raise to $2k from Niklas "ragen70" Heinecker from the cut-off. 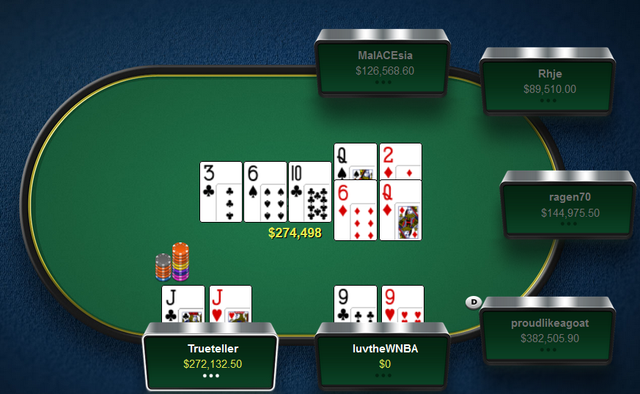 Isaac "luvtheWNBA" Haxton flat-calls from the small blind with 9c 9h and Trueteller three-bets to $12k from the big blind holding Jc Jh. Heinecker gets out of the way but Haxton makes the call. The flop comes down 3c 6s 10c and Haxton checks to Trueteller who fires a 2/3 pot bet. Evidently Ike isn't convinced he is in bad shape and he raises to c.$40k. Trueteller shoves for almost $150k and Haxton makes a hero call for his entire $116k stack. Drawing very thin Haxton fails to hit his two-outer and Trueteller takes down another huge pot. An interesting pot here with neither player even making a single pair in what turned out to be a $270k pot. Trueteller kicks off the action raising to $2.4k under the gun with Ac Kc. He is three-bet by Ben "Bttech86" Tollerene to $8k (Tollerene is holding the Qc 10c). After a call the pair see a 2 9 4 rainbow flop, with Trueteller check-calling Tollerene's $10.4k continuation bet. The 7h changes nothing on the turn and once again Trueteller check-calls a $28k bet from Tollerene. Another 7 (diamonds) completes the board and Tollerene goes for broke with his last $87k. Trueteller makes a great call with Ace high to take the third biggest online pot of his career. In Trueteller's second biggest pot he gets a little lucky on the river in a huge pot vs Paul "MalACEsia" Phua. Phua raised from UTG+1 to $2.4k holding 9h 9c with Trueteller re-raising to $8.8k from the cut-off with 6c 7c. MalACEsia raised yet again to $18.4k before the players took a flop of Ac 7h 8d. MalACEsia doesn't slow up betting $20.4k which Trueteller calls. 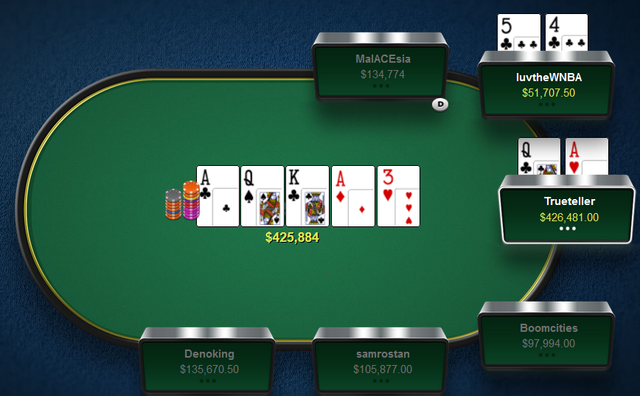 The 8c turn brings a flush draw for Trueteller who calls MalACEsia's next bet of $43.6k. 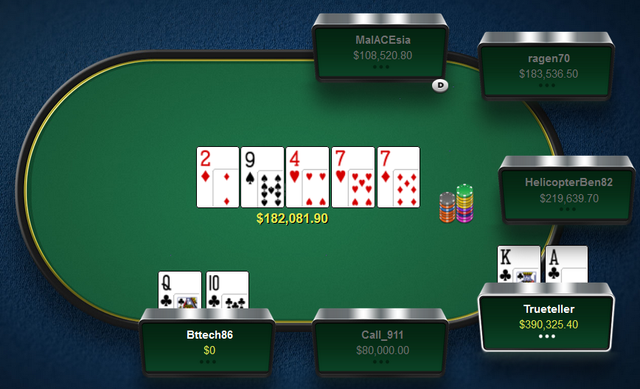 The 10c hits the river completing the flush draw and a number of straight draws - nevertheless MalACEsia puts his opponent all in for his last $124k. The call is made and Trueteller ships only his second ever pot of over $400k. Exactly one month before his other big pot against Ike Haxton, Timofey "Trueteller" Kuznetsov nailed Haxton for his biggest ever online pot after Ike made what can only be described as an 'ill-timed bluff'. The action starts with MalACEsia raising to $2.4k from the button. Ike three-bets from the small blind and both Trueteller (big blind) and MalACEsia call to see a flop, creating a $29k pot preflop.